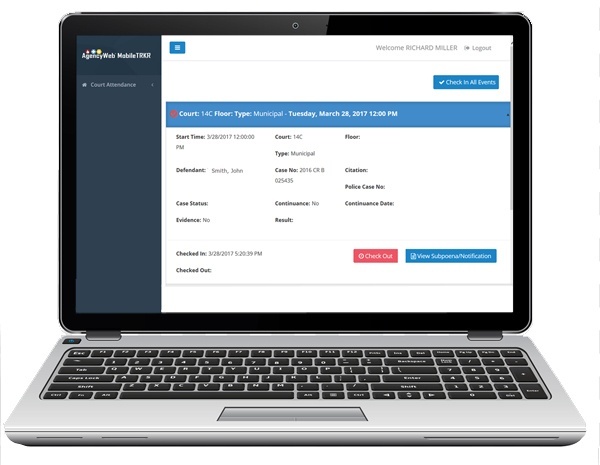 AgencyWeb® MobileTRKR is designed to track employee attendance that is unique for public safety... from firearm range certification, to volunteer station attendance, to court, training and on-call rapid-response arrivals and departures. Working in conjunction with AgencyWeb IWM and AgencyWeb CourtNotify software, AgencyWeb MobileTRKR can be used on any type of web-based device, regardless of location. be applied to ensure that logins/logouts are within close proximity of scheduled events.